The value-based educational program at Mizzentop Private School in Pawling was originally developed by an international coalition of educators working with UNICEF. It is at the core of everything we do here at Mizzentop. We integrate the value-based philosophy into everything we do for our youngest learners, whether it is focusing on reading and writing, math, science, or developing social and emotional skills. The research that was done during the development of the value-based program indicates that introducing it to children to the program as early as possible offered extraordinary benefits, including giving children an enduring, solid foundation from which to grow. 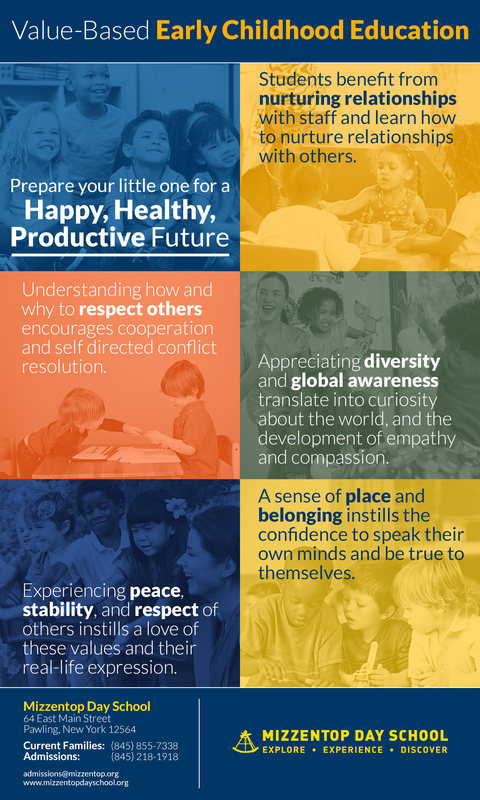 The application of the value-based approach for our youngest students focuses on the following elements outlined in the UNICEF guidelines. These are the goals of the program. Forming nurturing relationships: By nurturing our children and giving them the consistent emotional, cognitive, and intellectual support they need, they grow up with the ability and desire to provide that same nurturing to others. Providing physical safety and boundaries: When children feel safe in their environment, they develop more independence, are more likely to engage in activities that help develop motor skills, and learn to take appropriate risks. Tailoring experiences and educational approaches: Tailoring the environment to accommodate a child’s personality and learning style ensures that they receive all of the benefits that the value-based program has to offer. It also helps them appreciate differences in others. Supporting developmental and age-appropriate experiences: Setting appropriate goals and expectations is critical to early childhood development. Goals that are unattainable, or too easily reached, do not provide the critical social, emotional, and intellectual experiences children need early on. Nurturing a stable, supportive community: This is all about leading by example. By providing a nurturing, stable and supportive environment, the children in our early childhood programs learn how to do the same in their small communities of friends and family. Having respect for others and themselves, and using that understanding to resolve conflict and foster cooperation in real-life situations. Appreciating diversity and demonstrating support for differently-abled students. Understanding, at a developmentally appropriate level, the role of culture in their lives including the values represented via television and in other media. Development of an active and productive imagination, and taking imaginative approaches to social, emotional, and educational activities. Mizzentop Day School is proud to be one of the best private schools in Pawling. We live the value-based educational priorities every day with our students through community service, the proliferation of peaceful places, an advisory program to help students develop the emotional and social skills they need, and a curriculum that prepares them for a happy, self-aware, and productive future. If you want to learn more about our private school, please schedule a visit and come see us in Pawling. We look forward to getting to know you and your family. Mizzentop Day School admits students of any race, color, national and ethnic origin to all the rights, privileges, programs, and activities generally accorded or made available to students at the school. MDS does not discriminate on the basis of race, gender, color, or national and ethnic origin in administration of its educational policies, admissions policies, scholarship and loan programs, athletics, or other school administered programs.